Yes, creative blitzes are even possible before breakfast. Maybe even before coffee, but then that might be stretching it. 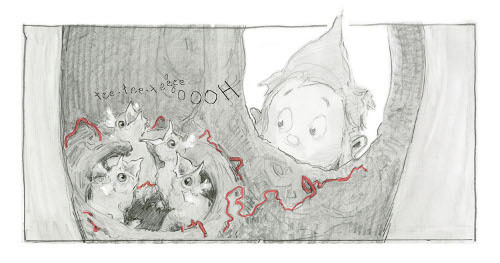 In Red Hat, what Booklist calls a picture book that is “almost wordless but seldom silent,” a young bear and his forest friends spot a knitted red hat a child has hung out to dry in the sun. 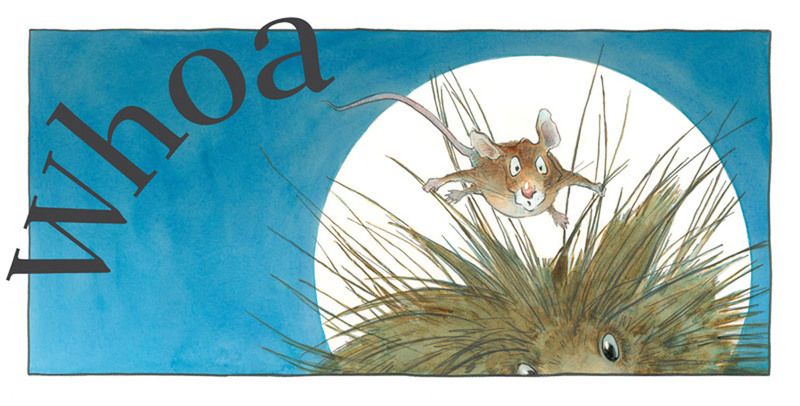 Unlike the last adventure, it’s Spring, and the animals are ready for some warm-weather romping. The bear grabs the hat, and off they go, the knitted creation coming undone in an extended moment of sartorial subversion: As the bear races off with it, more and more animals grab on, while it all gleefully unravels. 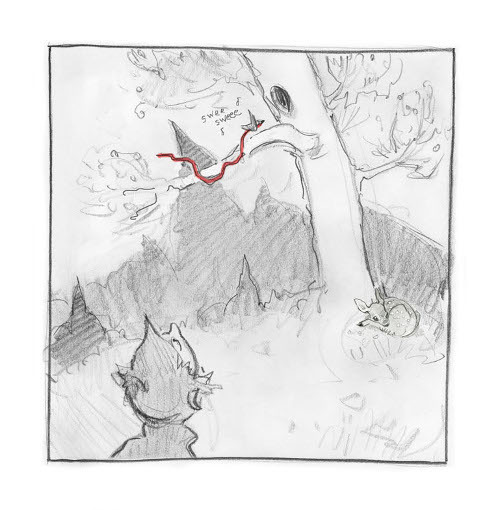 Once again, Judge plays with perspective as the action escalates, and she delights with sound effects and the very expressive faces of forest creatures, who completely ruin the hat on their spontaneous adventure and return it as a jumbled bunch of yarn. (See the very funny “Doot-do-doo” spread below.) No worries, though: The clever child has new plans for it, once she spots it, a plan that will please all involved. I’ll turn it over to Lita now, who this morning discusses the challenges of creating such a companion piece (which was rendered in watercolor and pencil), as well as what’s next on her plate. I thank her for visiting. 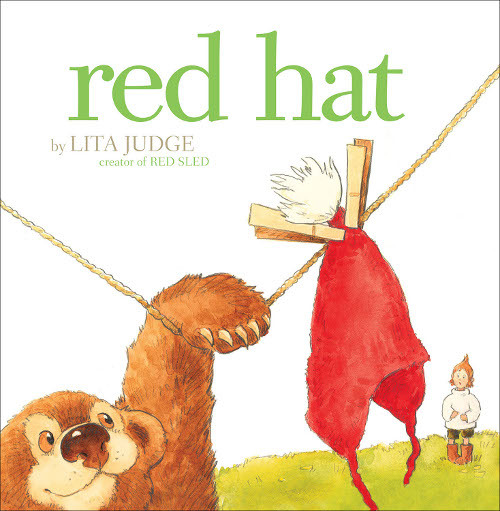 Lita: Red Hat is a companion to my 2011 book, Red Sled. Working on Red Sled was one of the best creative experiences of my life, which is saying a lot, because I’ve had so many! But when I got to the end of it, instead of feeling pure elation, I felt a little sad — inconsolable, really. I knew I just couldn’t leave these characters behind. All my books begin the same way: An inspiration strikes like lightning. Usually, it’s a character that leaps into my head, and suddenly I’m off and drawing. I feel like it’s a race to get the characters in my head down on paper, as they try this and that and dance and run about. My heart feels like it’s almost racing; it’s so exciting. 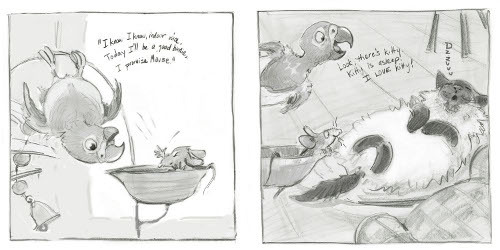 When I’m in this creative blitz, it’s hard to do anything else than just draw the characters until they feel real to me –- just taking time off to eat and sleep is a big pain in the neck. The early drawings look very realistic and slowly grow into the more whimsical expressive creatures that inhabit my stories. The hard part is when I begin asking myself, “but what do these characters do? What makes this a story?” Then the searching begins, and the drawings start to pile up by the hundreds in the studio. It can be an unsettling phase for me, but that’s okay, because basically I just love drawing and that’s what I get to do, as I set out to answer these questions — draw, draw, draw some more until I have a complete story and no unanswered questions. In the case of Red Hat, I began in a very different direction than the book eventually ended up. I wanted the book to be set in Spring and that the child (I affectionately call Alfie, though her name never appears in the books) takes her hat off to wash for spring-cleaning. 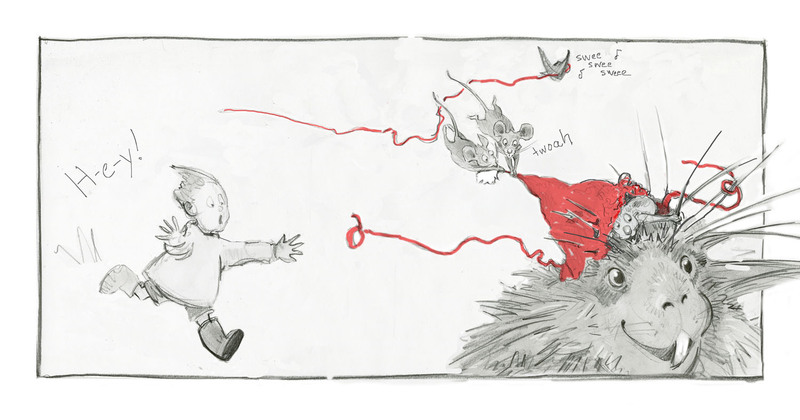 Then I thought, maybe some birds should come and unravel the hat to build a nest from the yarn. Yes, that would be fun. 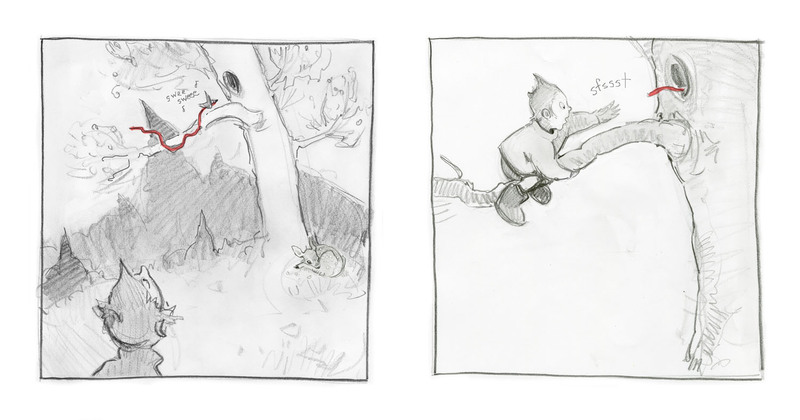 I set out to draw that story. But then I felt like all my favorite characters from the first story were missing! So I began again, this time with the porcupine from Red Sled stealing the hat. But that didn’t feel right either. I completed another entire rough sketch version of the book. And another. At this point, I learned that creating a companion book to a story that already existed was much harder than I first imagined! 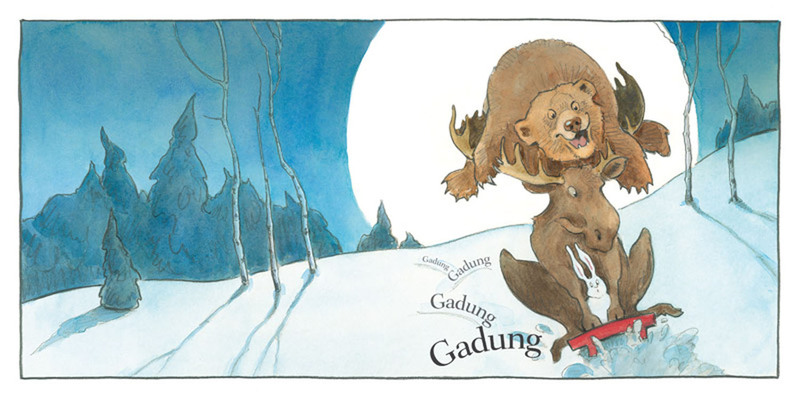 The first book was a winter night scene — lots of soft moonlight to contrast against the mad adventure of the sleigh ride with all the animals. This new book had to capture that same irrepressible energy of the first — but stand by itself as a story. The characters had to look consistent, even though Alfie was no longer buried in a snowsuit and hat, and now I had babies entering the stage. Everything was different, yet it had to feel like the same mythical place I had created for the first story. At last I had my AH HA! moment. In Red Sled, it is Bear who starts the mischief and keeps the energy rolling. I was missing her energy in the new story. So I began again. This time, bear brings her cub to the cabin, and little bear takes up the thread of the story and shows he is every bit the mischief maker his mother is. The process of creating Red Hat is a perfect example of why I love creating stories. 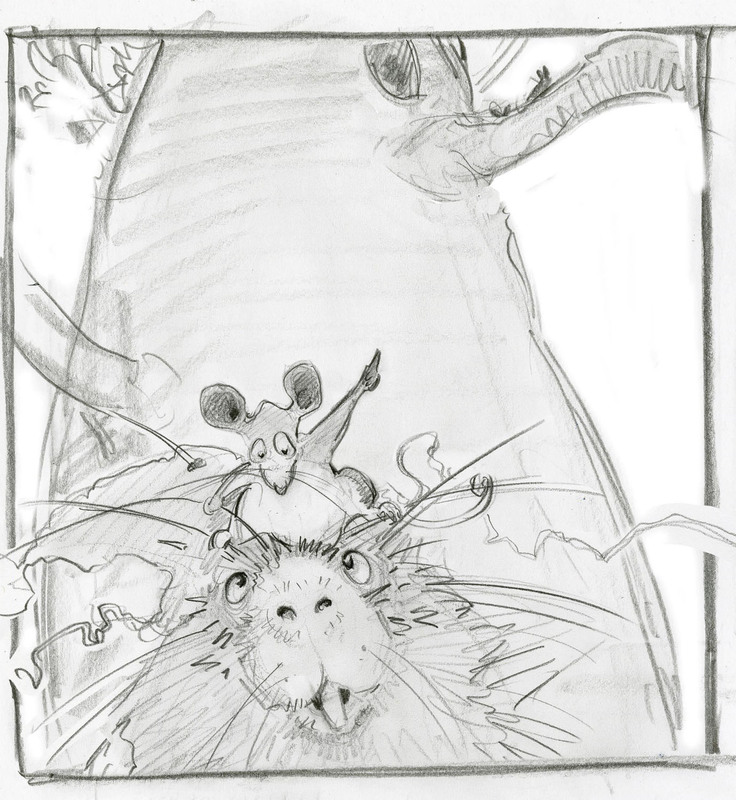 Even when I have a spark of an idea and characters I love and have worked with before, I still have the adventure and mystery of figuring out what happens next. I have no answers when I sit down at the easel, just the love of drawing and the desire to find stories for those characters. Red Hat is finally released now, which means lots of time has gone by since I completed it, and I’ve had many more adventures with new characters. 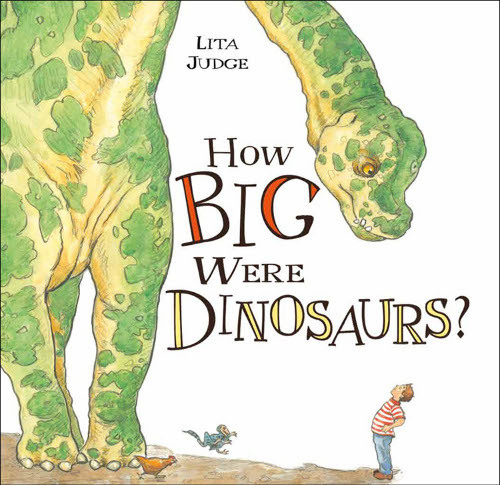 My next book, How Big Were Dinosaurs?, will be coming out this August with Roaring Brook. 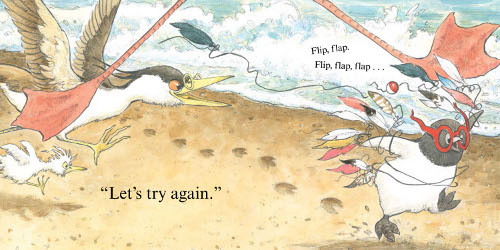 This book was directly inspired by conversations with kids. 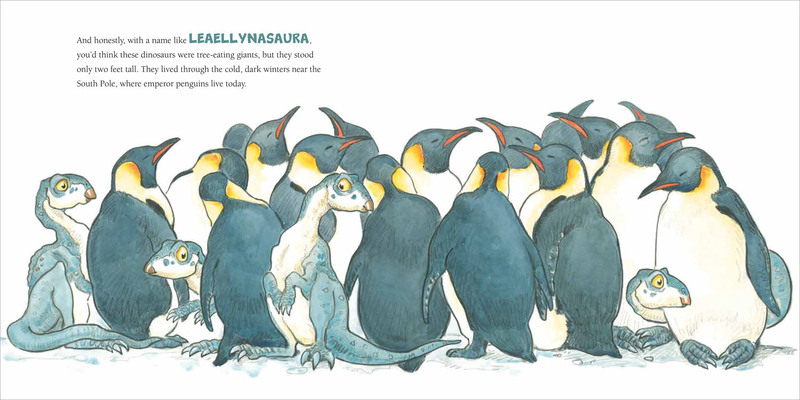 I found in talking with kids about my previous books on dinosaurs [that] I spent a lot of time listening to tales of dinosaurs being five stories tall or ten blocks long. The fantastic numbers for the size of dinosaurs always seem to grow in a young child’s imagination. 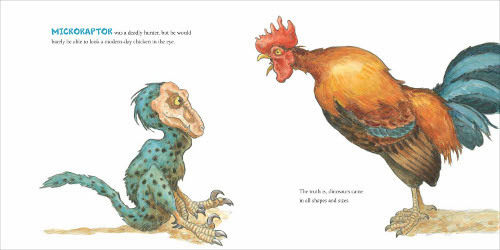 That’s cool, and I remember well fantasizing about colossal giants roaming the earth, but I also remember being fascinated when I learned that some dinosaurs were only the size of a chicken. The dinosaur books I had as a kid just listed facts and figures. I wanted a graphic depiction of how big they REALLY were! One of my passions for creating non-fiction books is representing facts with pictures that more fully convey the topic. 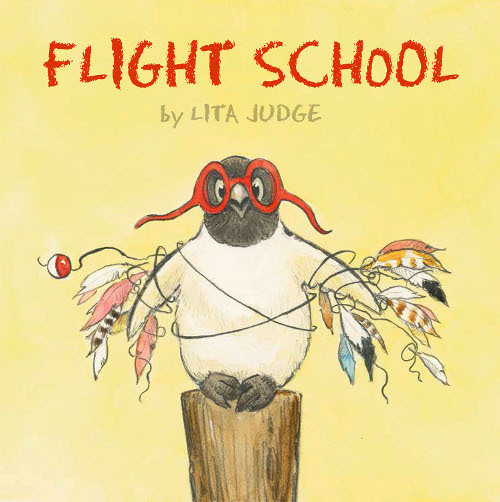 Then I had a ball creating a story called Flight School, about a penguin who has a little round body, but the soul of an eagle, and sets off to the land where birds learn to fly. In the end he is still a little round penguin and must come to terms with it, but his love for life never lets him down. I can’t wait to share more about this character when it comes out next Spring. This story is deeply personal and actually reflects my own journey to accept some physical limitations I now have, due to a chronic health condition. But just like penguin, I don’t let it get me down. The joy over doing the things I love most keeps me marching along. 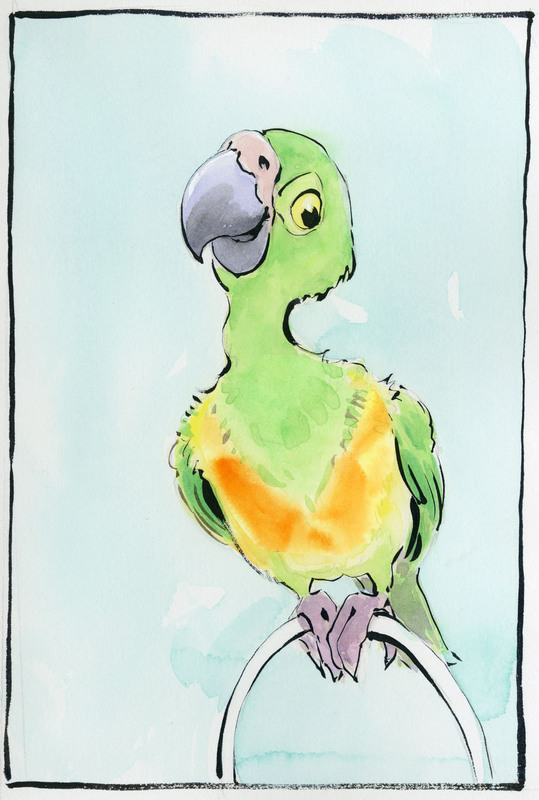 Now I’m happily pursuing a story about a certain little green parrot, named Beatrix Potter. 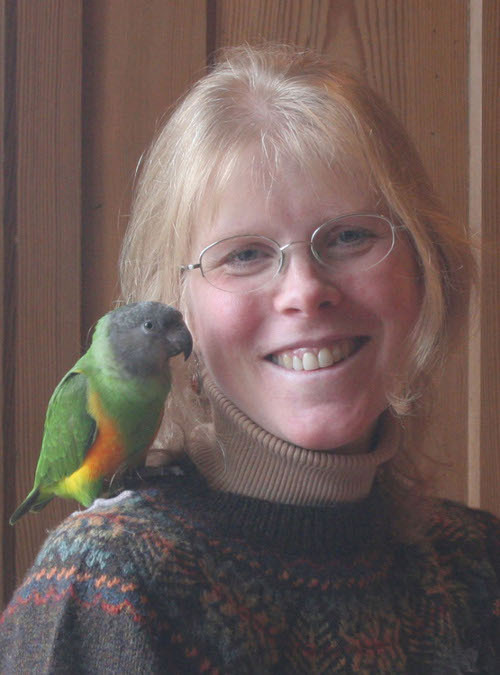 Readers who follow my books know I love animals — and, particularly, birds. About a year ago, I finally made one of my lifelong dreams come true by adopting a parrot! Of course, instantly I began drawing her. And almost as instantly, her personality came shining through, and her story started taking shape. She’s irrepressibly happy, and I love her madly. She also has the attention span of a two-year-old (and about the same intelligence! ), so she can keep you on your toes. What fun it is capturing her energy in a story. For anyone interested in meeting Beatrix, please stop by for a visit on my website, and you can see her wearing a little red hat for my Red Hat video. RED HAT. Text copyright © 2013 by Lita Judge. Published by Atheneum Books for Young Readers, New York. All images here reproduced by permission of Lita Judge. Oh, the sheer pure joy of reading this post on a gray, snowy Tuesday morning is without measure. Thank you, Jules for featuring Lita Judge. Her books glow with life. 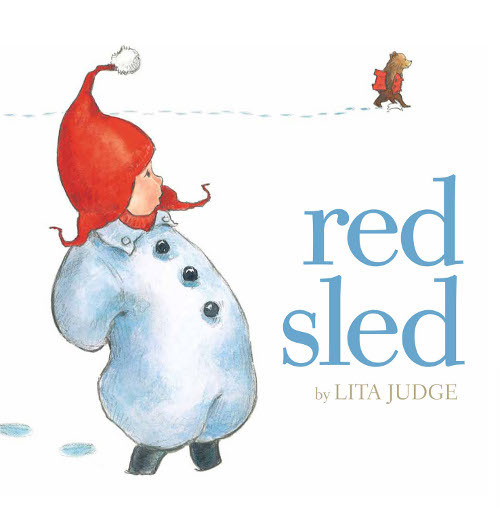 RED HAT and RED SLED are both so delightful and *just right* — love hearing the story behind Lita Judge’s latest! What a delightful read! 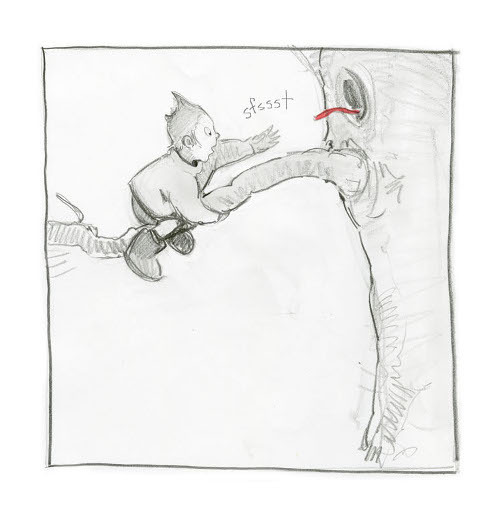 So much great character action and whimsy packed into one post . . . and the little Beatrix Potter parrot at the end is a real heart stealer. Perfectly expressed with such an economy of line. Bravo! I love my copy of RED HAT (signed – thank you very much 🙂 ) and I’m looking forward to HOW BIG WERE DINOSAURS? ! Thanks for sharing a bit of your process. I very much admire your technique and your lively, totally fun characters 🙂 I am a fan!